THIS BLOG HAS MOVED ! DETAILS ARE BELOW!!! : SPEND YOUR TIME OR THEIR ENERGY? SPEND YOUR TIME OR THEIR ENERGY? Children have much more energy than any grown-ups have. When you have something more than usual what do you do? You use or spend it, right? So, children need to spend all this extra energy. But how and when? If you plan your lessons well you have the advantage, if not then be ready for interruptions, spoilers and nonefficient classes. Here, I will be telling you about some energy reducing games and activities. 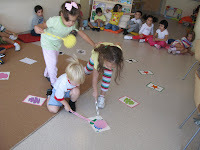 A fun and very active game you can play during your class is "Flyswatter". You can take any topic you want for this game. You have to get your flash cards and a couple of flyswatters. Lay down the flash cards on the floor as a circle. Choose a group of kids according to the number of your class. While the kids are in the center of the flash cards, holding the flyswatters, you call out a flash card or a sentence that addresses a flash card. (Calling out a word or a sentence depends on the level and what you taught before.) Then kids run and hit the right flash card with the flyswatters they hold. You can make groups and give them points or just tell the first hitter "Well-done!" . Just as long as they don't swat each other too often this sounds like a lot of fun! You're very right about kids' energy levels and the importance of allowing them to keep moving (or face the consequences). 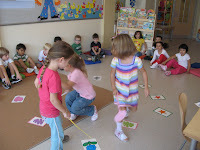 This is such a great activity to use it with kindergarten students and even with lower primary. We can hang the flashcards on the walls/board and we can use realias as well. Thank you so much for sharing it with us! !